One of the most reputable brands in the smoking accessories market, SkilleTools has made quite an impressive name for itself with its extensive selection of fine quality tools and accessories. The company’s products are of uniformly high-quality, and are designed to meet the specific needs of the most discriminating users. Suffice it to say that if you are looking for a supremely high-quality smoking and dabbing implement, SkilleTools can provide it to you. 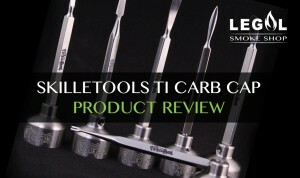 The reputation and renown of SkilleTools is such that we couldn’t help but be a little excited at the prospect of reviewing the titanium carb cap set. We have already tried out several of the company’s products, including the celebrated line of dabbing tools that took the concentrates world by storm. Therefore, we weren’t surprised at the high level of craftsmanship and design exhibited by SkilleTools’ titanium carb caps. All the carb caps in this set are made from pure Grade 2 Titanium, giving them a durability and reliability that other similar products on the market simply can’t match. 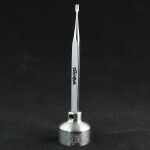 We say ‘similar’ because, although there are scores of other dabbing tools and sets available on the market, very few come close to comparing favorably with SkilleTools titanium carb caps. In fact, it wouldn’t be a stretch to say that these SkilleTools carb caps are the finest tools of their kind in the market today. Adding even more functionality is the inclusion of a threaded dabber with every carb cap. These dabbers aren’t just afterthoughts or add-ons either. Each one is designed to the same standards as the standalone dabbers in the SkilleTools catalog, so you can expect the same reliability and excellence in construction as well as performance. 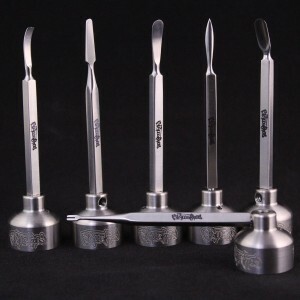 Essentially providing you with a free dabber with every carb cap, the SkilleTools titanium carb cap set is practically an all-in-one solution for your dabbing needs. You can even attach your favorite dabbing tips if you wish, giving you the benefit of a fully customized dabbing tool set. Add a rig, a torch, and some quality concentrate, and that’s pretty much all you need to have a good time! Carb caps are especially suited for low-temperature dabbing, which keeps the temperature of the cannabinoids much lower than the boiling point. This minimizes wastage, and ensures that you get the full effect of every hit. With the SkilleTools titanium carb cap set, your concentrates will last a lot longer due to the high level of efficiency provided. Concentrates are growing quickly in popularity. Simple, potent, and highly effective, dabbing delivers what is for many the purest, smoothest, and most enjoyable way to enjoy herbs. That being said, you really do need high-quality tools in order to get the maximum benefit from using concentrates. Based on the superb construction and stellar performance of the SkilleTools titanium carb caps, we may have just found the ideal tools.